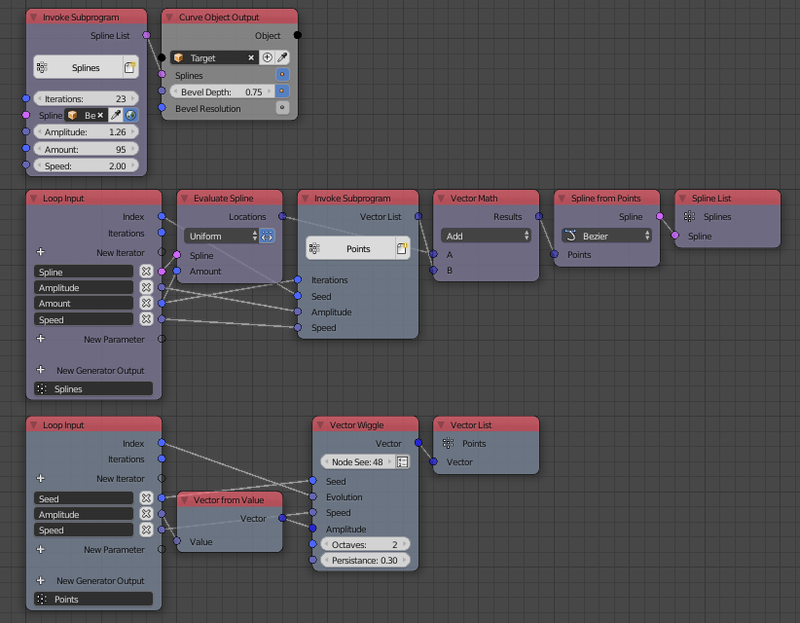 I'm quite new to the animation Nodes concepts, and tried to follow this recent tutorial (https://www.youtube.com/watch?v=GzeP---dP1M&list=WL). The point of the tutorial is to generate a bunch of random splines all from a first spline, and then add some moderate noise (in location) to each point from each generated spline. You get a nice cooked spaghettis effect. 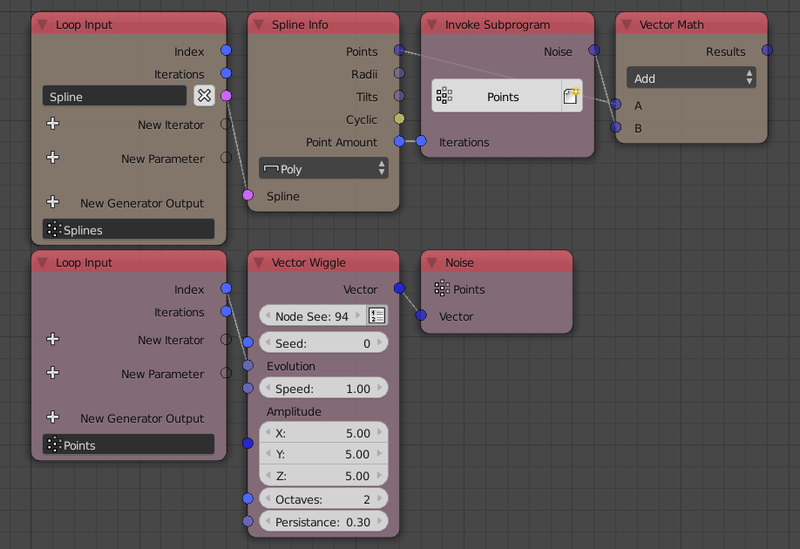 Works ok, but then i tried to replace the script subprogram by a wiggle vector Node (see 6.20 in the video). But i just don't manage to get the vector wiggle randomness (seed) independant from the Getpoints Loop. My splines stay "parallel" whatever i try. My guess is i should try to generate a random integer outside of the GetPoints loop and plug the result into the seed of my vector wiggle, but i just don't get it right. You don't need to generate a random number to use as seed, seed is arbitrary, it only matters that it is different, and thus you can use the index directly. Matter of fact, the random numbers may repeat while the index will never, which ensures different results for each iteration. 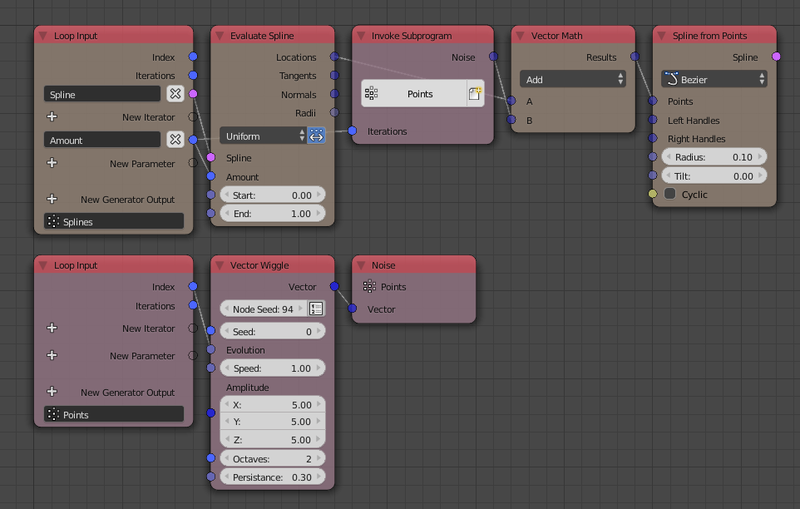 Moreover, float can be converted to integers implicitly, so you don't need the Round Node. So you see that for any combination of $x,y$ belonging to the domain,the output is distinct and always exist, that is, the function is bijective. And it can be safely used as seed. 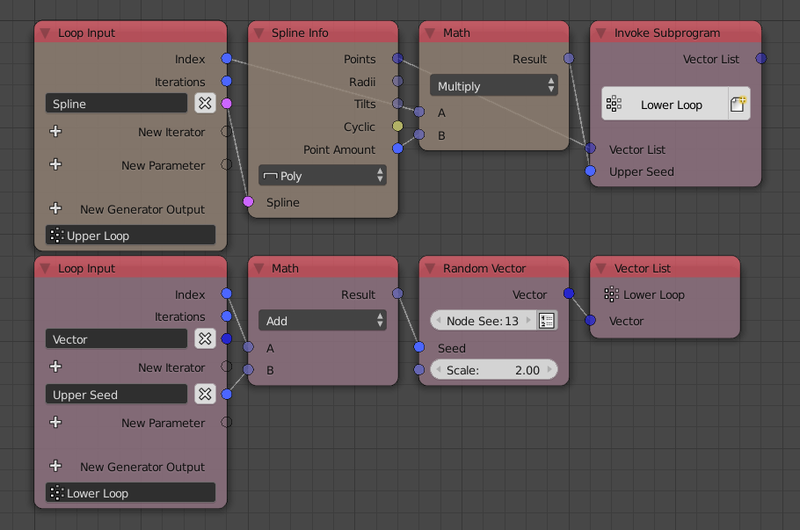 The use of the Replicate Spline Node in the tutorial or your node tree does not seem to be correct, you don't want to have spline that are distant as they are now, instead, one can simply input the spline as a parameter and control their amount using the number of iteration. Don't create the splines as poly and convert them to bezier after that, just create them as bezier directly. Which is similar to the result of the tutorial. Not the answer you're looking for? Browse other questions tagged animation-nodes or ask your own question. How do I create new objects from a mesh created from animation nodes? 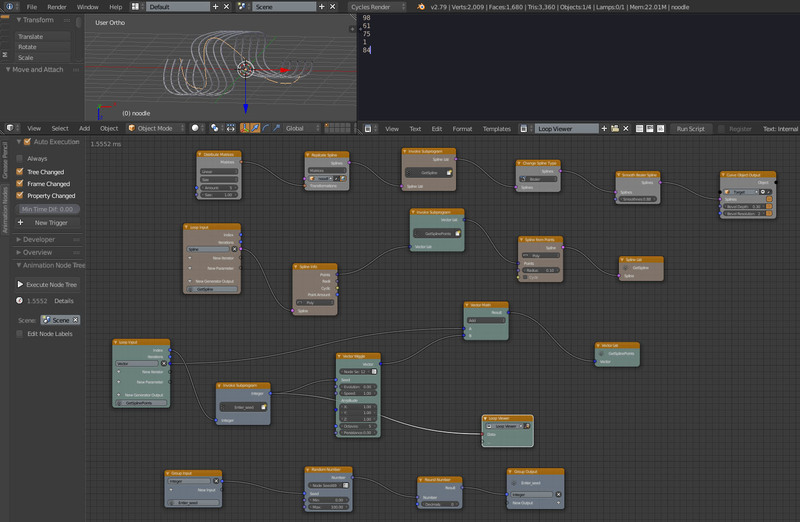 Animation Nodes: How to create splines from two different points in order to create procedural telegraph poles?